The fourth seed Portland Trail Blazers will face off against the fifth seed Memphis Grizzles in the first round of the Western Conference playoffs. The Blazers won the Northwest Division. The Grizzlies, who finished second in the Southwest Division, finished with a better record (see below) than the Blazers and, therefore, have home-court advantage. The Grizzlies won the season series, 4-0. The teams have never met in the playoffs. 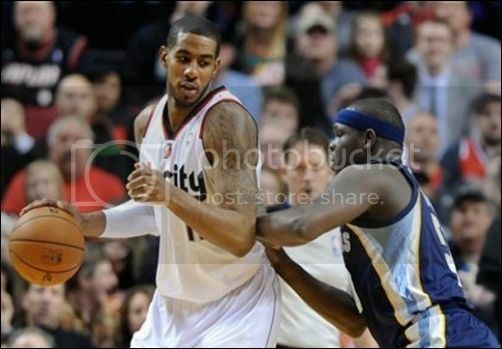 The Blazers are led by forward LaMarcus Aldridge, guard Damian Lillard and forward Nicolas Batum. The Grizzlies are led by center Marc Gasol, power forward Zach Randolph and guards Mike Conley. Blazers -- 51-31 overall; 32-9 Home; 19-22 Away. Grizzlies -- 55-27 overall; 31-10 Home; 24-17 Away. Grizzlies: Marc Gasol 26 pts; Zach Randolph 13 reb; Marc Gasol 10 ast. Blazers: Wesley Matthews 26 pts; Chris Kaman 11 reb; Damian Lillard 9 ast. Blazers: LaMarcus Aldridge 32 pts; Chris Kaman, 11 reb; Steve Blake 8 ast. Grizzlies: Zach Randolph 20 pts; Zach Randolph 15 reb; Marc Gasol 6 ast. Grizzlies: Marc Gasol 21 pts; Zach Randolph 9 reb; Mike Conley 8 ast. Blazers: Damian Lillard 18 pts; Nicolas Batum 10 reb; Damian Lillard 7 ast. Blazers: Damian Lillard 27 pts; Robin Lopez 7 reb; Damian Lillard 7 ast. 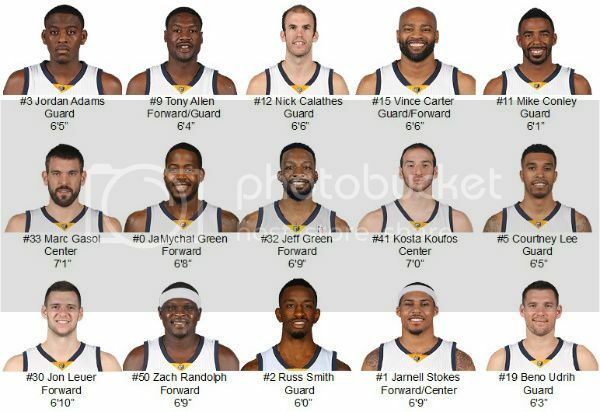 Grizzliles: Jeff Green 23 pts; Tony Allen 11 reb; Mike Conley 9 ast. 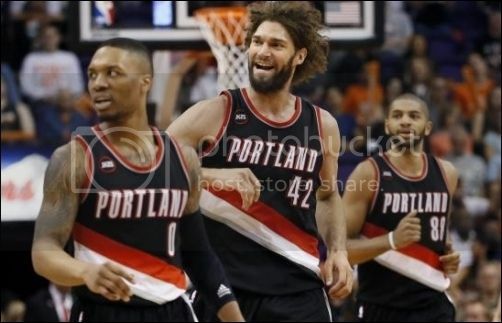 Damian Lillard, Robin Lopez and Nicolas Batum. Injury status applies to game 1. Please check individual game threads for updated injury statuses. Portland is making its second straight playoff appearance and fifth in the past eight seasons. They defeated the Houston Rockets in a wild first round series last season, culminating with Lillard's buzzer-beating three in game six to send them to the conference semifinals where they would be eliminated by the eventual champion San Antonio Spurs. Portland has made the NBA finals three times, winning the NBA championship in 1977. The Blazers are led by their all-star duo of Aldridge and Lillard. Aldridge put off surgery to repair a torn ligament in his left (non-shooting) thumb to finish out the season. Lillard earned his second all-star bid. Matthews was a staunch defender and third option for the team until he was lost for the season with a torn Achilles in March. Batum struggled early in the season, but became more reliable after the all-star break. Lopez defended well inside and was a viable offensive option some nights. 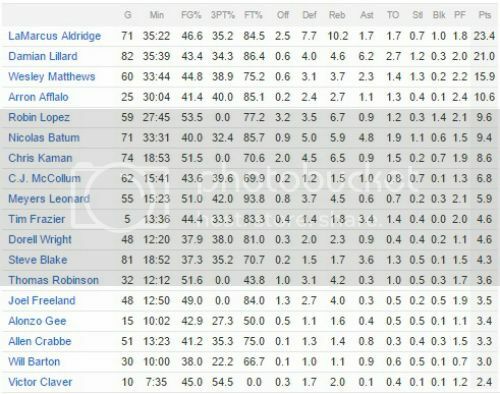 The story of this season could be the bench, which saw huge improvements from McCollum and Leonard. Kaman was exactly what the free agent doctor ordered, while Blake was a consistent distributor and defender. Freeland has emerged as one of the team's best defenders and Wright proved he is more than just a three-point shooter. The team was 8-0 with Crabbe as a starter. Trade acquisition Afflalo was still adjusting to the Blazers system when he went down to injury, but he should be back early in the series. Gee may be as good a defender as Matthews. Late-season signee Frazier averaged 8.5 assists in the last two games of the season. LaMarcus Aldridge led the NBA in field goals made with 659. He was third in attempts with 1,415. Steve Blake assisted on over one-fifth of Chris Kaman's made field goals. 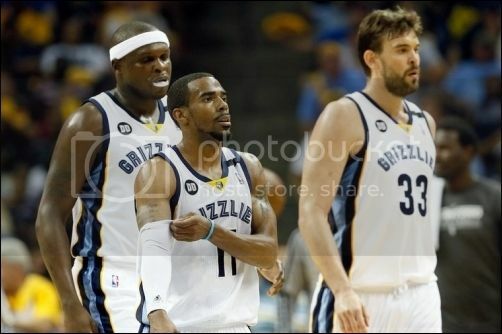 Zach Randolph, Mike Conley and Marc Gasol. Memphis makes the playoffs for the eighth time in their history. Each of those appearances have come since the team moved from Vancouver, B.C. in 2001. Last season, the Grizzlies faced the Oklahoma City Thunder in the first round, taking the series to seven games before falling to the Thunder. The teams combined for an NBA record four straight overtime games during the season; games 2-5. The Grizzlies won all but game 4 of the overtime matches. The furthest the Grizzlies have advanced in the playoffs was the Western Conference finals in 2012-13, when they were swept by the San Antonio Spurs. Gasol can be a force at both ends of the floor and is commonly referred to as the top center in the NBA. Former Blazer Randolph excels at cleaning up the boards. Conley, whose injury may keep him out of games at the beginning of the series, is one of the better defending point guards in the game. Allen, whose injury status also is undetermined, excels at defense and can hit some shots. 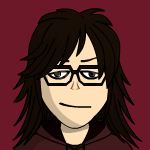 Lee is an exceptional defender who can be deadly from beyond the arc. Jeff Green brings the offense and can do some damage against a lax defense. Udrih, who will start if Conley can't go, has hurt the Blazers in the past. Carter is the veteran of the group and has a few drops of fuel in his tank. 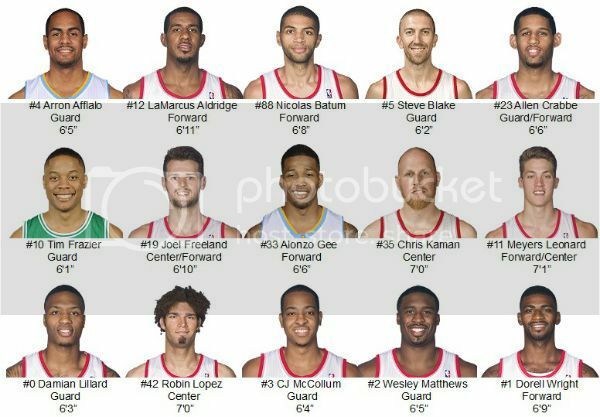 Koufos, who played high school ball with the Blazers' McCollum, is the back-up big man. 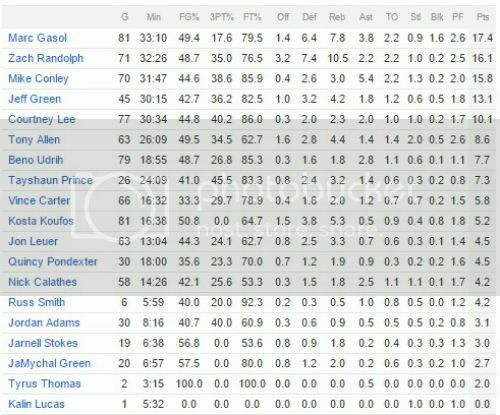 Leuer and Calathes will see some spot minutes. Stokes, Adams, Smith and JaMychal Green will likely be called upon only in the event of injury, foul trouble or a blowout. The Grizzlies got out to a quick start during the regular season, winning 21 of their first 25. Zach Randolph is fifth among active NBA players in double-doubles with 439. The guys at NBA Game Time take a brief look at this series. Note: As with regular season games, we will have threads for each playoff game. I'll be honest: I'm not very confident with this series. Too many injuries for us, along with Memphis sweeping the regular season series. Not to mention that our defense has been god awful lately.Let's just hope that we can go down with a fight. i know what you mean. i think Memphis is the last opponent most of us wanted. the only thing that could help us is if Conley and Allen are out for a few games. our defense has been non-existent the past few games. i'd like to see us become more focused. it wouldn't hurt if Stotts didn't always have that deer-in-the-headlights look. I am not overly optimistic. We sort of stumble into these playoffs. I am hoping we have all the guys back and can make a little noise. Aldridge and Lillard are going to have to play great. We could have a chance here. If we can win game 1, which won't be easy, we could match up with them well enough to win the series. This is not the opponent I was hoping for though. We've got to play as best we can each minute of each game. We can win if we play the way we played at the beginning of the season. It's all 0-0 right now. This has the potential to be a great series. Even if Memphis wins, the games could be very close. I would like to see the Blazers steal game one. That could very well be the key to the series. The first two games didn't work out very well. My hope is that the team can get back on track, win a couple of games, and gain some momentum as they go back to Memphis for game five.